so named after its paten­tee, a young Scots­man, with a genius for mechan­ics, Mr T Cos­sar, Gov­an Press […] embod­ies the lat­est improve­ments in print­ing off a flat bed of type, and with a roll of paper instead of cut sheets. The paper after being print­ed is cut off the reel, fold­ed and deliv­ered ready for sale at a speed of 4000 to 5000 per hour. 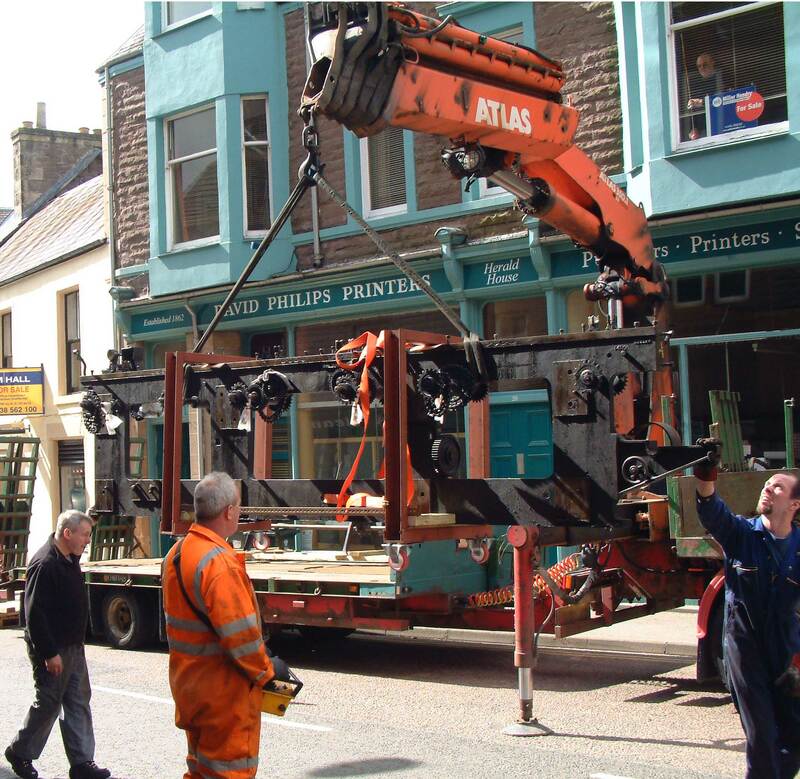 The ‘Cos­sar Patent Flat Bed Web News­pa­per Print­ing Machine’ was built into the premis­es of David Philips Print­ers, Com­rie Street, Crieff, under the super­vi­sion of its Scot­tish design­er in 1907. It is thought to be the last remain­ing exam­ple of the orig­i­nal design in the world, and the old­est reel-fed flatbed news­pa­per print­ing press in Britain still in work­ing order. It was used to print the local week­ly news­pa­per, Strat­hearn Her­ald, every sin­gle week from the orig­i­nal instal­la­tion of this machine until 28 March 1991, when the title was trans­ferred to Scot­tish and Uni­ver­sal News­pa­pers (now part of Trin­i­ty Mir­ror plc). The Crieff Cos­sar is an impor­tant part of the Scot­tish print­ing industry’s tech­no­log­i­cal and indus­tri­al her­itage: the Scot­tish Print­ing Archival Trust lob­bied for it to be saved from scrap, and led the fundrais­ing effort to ensure its future. The Trust is grate­ful for the gen­er­ous sup­port from the Nation­al Print­ing Her­itage Trust, the Scot­tish News­pa­per Soci­ety, Unite the Union, the Oxford Guild of Print­ers and indi­vid­ual donors. Because of the con­straints on access, it could only be removed from the premis­es in Crieff as it was installed — in pieces. It has now been rebuilt and remains in tem­po­rary stor­age in Gov­an, near its inventor’s child­hood home. It will move to the Nation­al Muse­ums Col­lec­tion Cen­tre in Edin­burgh once cur­rent devel­op­ment plans are in place. It is hoped that the rebuilt and refur­bished press, now returned to full work­ing order, can be used for demon­stra­tions in the future. A ‘Cos­sar Club’ has been estab­lished to bring togeth­er indi­vid­u­als inter­est in the press, and to sup­port its future use for print­ing demon­stra­tions. In the 1890s, Tom Cos­sar was exper­i­ment­ing with adap­ta­tions to the ‘Wharfedale’ flat-bed press­es used in the fam­i­ly busi­ness, John Cos­sar & Son. The firm had its ori­gins in the 1870s, as a gen­er­al print­er, and lat­er became the pub­lish­er of the Gov­an Press. Its founder, John Cos­sar, was born in Lanark­shire in 1841, and appren­ticed as a print­er in Big­gar. After a peri­od in busi­ness on his own account in Car­luke, he moved to Glas­gow where his busi­ness grew. He was the inven­tor of a fold­ing and past­ing machine, but took out no patents. After var­i­ous moves, new premis­es for the firm were built on the cor­ner of Gov­an Road and Burndyke Street: the façade of the build­ing still stands, with the busts of Cax­ton, Guten­berg (mis­spelled as Gut­ten­berg), Robert Burns, Sir Wal­ter Scott and Mr and Mrs Cos­sar them­selves. John Cos­sar died 1890, aged 49, only six months after the firm moved to Burndyke Street. His wife took over run­ning the busi­ness, and in 1891, added Clyde­bank Press and Ren­frew Press to the oth­er two titles pub­lished, Gov­an Press and South­ern Press. Mrs Cos­sar remained an impor­tant fig­ure in the busi­ness until her death in 1926 at the age of 83. The cou­ple had two sons, Thomas and Andrew, and it was the lat­ter who even­tu­al­ly took charge of the busi­ness. Thomas, who had ini­tial­ly served an appren­tice­ship in the local ship­build­ing yards, returned to work in the fam­i­ly busi­ness. He con­tin­ued to use his engi­neer­ing exper­tise, exper­i­ment­ing on the firm’s Daw­son two-feed­er ‘Wharfedale’, suc­cess­ful­ly con­vert­ing it into a reel-fed press. Accord­ing to the Pover­ty Bay Her­ald of 10 August 1907 ‘Every week, after the paper had been issued, he would pull a por­tion of their own machine down and exper­i­ment’. The first patent on Cossar’s new machine was tak­en out in 1899. This morn­ing, for the first time, the Chron­i­cle is print­ed on the Cos­sar Patent Flat Bed Web Machine, which recent­ly came to hand from the mak­ers, Messrs. Payne & Sons, of Otley, York­shire. This machine was spe­cial­ly select­ed by our Mr J A Young, after a care­ful and prac­ti­cal inspec­tion of all the best and lat­est machines suit­able for print­ing a paper like the Chron­i­cle, which the best known builders of the Old Coun­try had to offer. It is, indeed, the first machine of the kind per­fect­ed. Read the full arti­cle here. This was a sin­gle-cylin­der machine which print­ed an eight-page news­pa­per in two oper­a­tions, and was fol­lowed with­in two years by a two-cylin­der ver­sion, the first of which was installed in a Scot­tish news­pa­per office. Around fifty machines of this kind, includ­ing the press installed in Crieff, were pro­duced before a new mod­el was devel­oped in 1915. Soon after this Payne & Sons became part of the firm of Daw­son, Payne & Elliott. Fur­ther improve­ments to the design were made to allow for the print­ing of larg­er news­pa­pers. … the machine installed at the Her­ald works con­tains over 2000 parts, from very heavy cast­ings to the fin­er pieces. … thir­ty steel and com­po­si­tion rollers are used for receiv­ing the ink from three sep­a­rate ducts reg­u­lat­ed by a series of screws. The whole arti­cle includes a descrip­tion of the prin­ci­ples on which the machine works, and you can also see the Strat­hearn Her­ald’s machine in action. You can also watch the lat­er mod­el B8 and B4 machines in action in New Zealand. it was to his ben­e­fit when vis­it­ing news­pa­per offices after the war the the Cos­sar press was held in such high esteem. News­pa­pers pur­chased the machine not only because of its reli­a­bil­i­ty but also because of the per­son­al atten­tion which had been giv­en to cus­tomers by the late Mr Cos­sar.